If there was a weekend living in Misawa where you couldn’t find anything to entertain yourself, you were sadly living with your windows down, doors closed, and your eyes and ears covered. For most of us, there was never a dull moment or a new adventure not anxiously awaiting our discovery. Take November for example. In the States, many Americans stay inside, hiding from the cold, waiting patiently for the Thanksgiving Holiday. In Japan, they celebrate a “remarkable” event almost every weekend. The second weekend of November marks the return of the salmon. 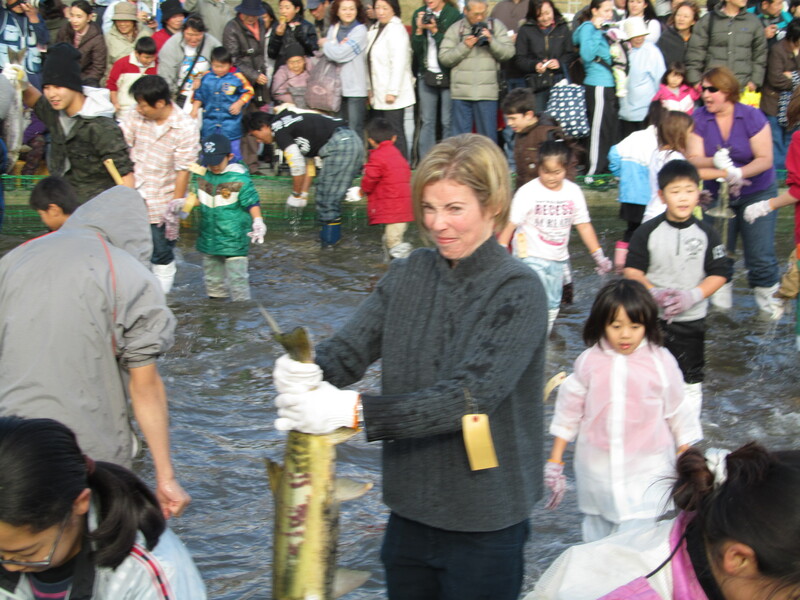 I don’t remember growing up celebrating the return of any migratory creature, but in Japan, it serves as an excellent excuse to put on a festival. “I heard about a salmon festival over in Oirase Town this weekend. What do you say I take you there for lunch and we can walk around and check it out?” Dave asked me on a Sunday morning as we left the chapel service. “Yeah, the Bjorn’s in the car, but I’m not totally certain where the festival is, but my guess it’s at that park we’ve seen along the river.” He said while he strapped Cameron into her car seat. “I remember. I think I could get us back there again. May as well try it and see what happens; Oirase’s only fifteen minutes away. It’s a gorgeous day out today.” I replied as I buckled myself into the car. It was very clear where the festival was being held as we approached the nearby small town. The traffic wasn’t congested, but there were fish-shaped flags directing the way for miles. “These people seriously celebrate everything, don’t they? Today it’s salmon, tomorrow it’s rice, but not just rice, we must celebrate planting the rice, growing the rice, harvesting the rice, and don’t forget the festival for eating the rice! I’ve never been to more festivals in my life and they are all so different.” I said making conversation. “Whoa, that’s a lot of salmon babies! I bet they aren’t happy they came back today. Oh, there’s an open parking spot!” I pointed Dave the direction of the space. We unloaded the car in the crowded, dirt-covered parking lot, and situated Cameron comfortably in her carrier on Dave’s chest. We were never at a loss for bottles and diapers, so we were able to gather our necessities, put on her warm, sun hat, and follow the crowd into the festival grounds. A large clay replica of the U.S. Statue of Liberty stood as our welcome into the festival grounds. 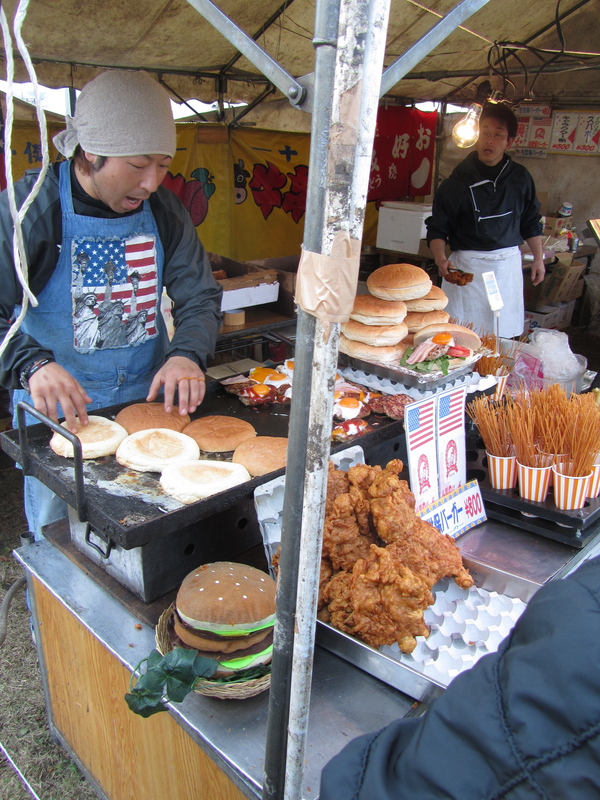 We strolled down a row of food booths that were strangely “Americanized.” The workers were wearing clothing with American labels on them, like a large flag, or Abercrombie & Fitch logos, or various U.S. college paraphernalia. 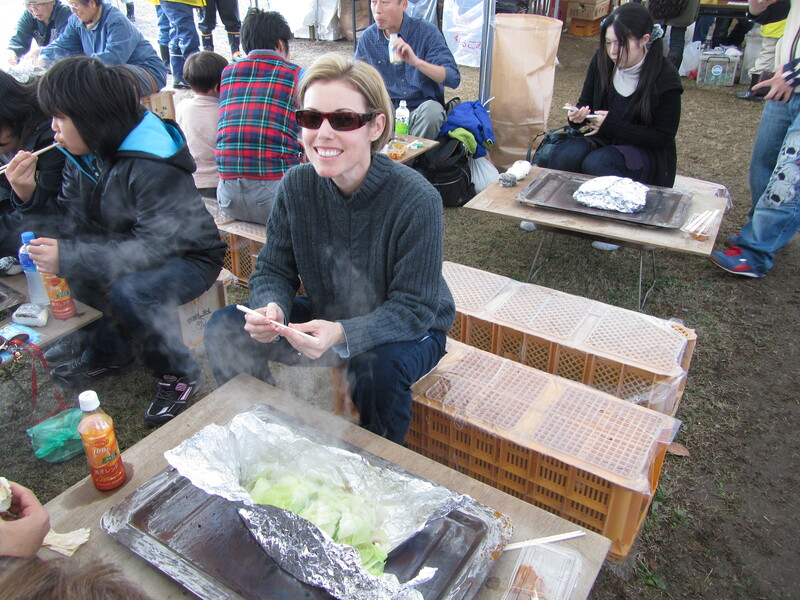 Oh, the wonderful and unpredictable Japanese festivals! “Do you wonder who they are trying to attract to this festival?” Dave asked me as we stopped to photograph a food booth selling the largest mass of fried mystery meat we have ever seen. The booth had a fake, plush, all-American hamburger several layers high sitting next to a grill where a man donned an apron covered with Lady Liberty and the American flag. He was grilling hamburger buns larger than Cameron’s head. In true Japanese style, they had a display of the final grilled product complete with the customary raw egg sitting on the top. I will never understand the raw egg they liked to place over the top of their foods. Soups, pizza, pork cutlet, stir fry, vegetable trays, and now sitting proudly on the hamburger. Not my favorite. Dave wandered into a large white tent. The tent was packed with people sitting on the back of milk crates at tiny rectangular, wooden tables topped with a single large hot plate in the middle. The hot plate was covering a square bucket of red hot coals hidden underneath. Is was important to watch out for your knees! As we looked around, Dave recognized a friend from work who waved us over to join them at their table. They had just been seated. Dave introduced me to the couple while we settled down on the facing milk crates. A worker ran up to the table asking if we were eating “salmon for four?” We all looked at each other for affirmation and nodded our heads to the server as she ran off to retrieve our meal. “That’s why we’re here. You never know what you’re gonna get. Is this your first time to the festival?” I asked. “No, we were here last year, but we weren’t brave enough to try everything. This year, I think we have it down to a science, wouldn’t you say, babe?” He replied, pulling his wife into the conversation. “Yeah, we were looking forward to the salmon this year. It’s worth it.” she had just finished her sentence when another server wearing heavy lined gloves came over carrying a large bucket filled with hot coals. He put the bucket down and moved our hot plate to one side. He used a wrought iron shovel to refresh our coal supply, and warned us in Japanese with several iterations of “abunai, abunai,” meaning danger. After he left, our first server came back holding a bundle of tinfoil wrapped around our lunch. She centered our hot plate over the coals and placed the foil pack down in the center. She asked us to wait fifteen minutes. We looked around as other groups were enjoying their meal and recognized we were soon in for a treat. Our server returned to our table one more time and deftly using her chopsticks, asked us to back up as she opened the steaming, hot foil. She asked us to wait for a moment while it cooled down, but to enjoy. She gave us a full bow as she rushed off to continue her work. Dave had to sit sideways so Cameron didn’t get singed with the steam, but the meal was delicious. Fresh wild salmon with cabbage, carrots, and onions- excellent! Cameron mostly ate her applesauce, but she was introduced to her first few pieces of salmon, and I admit she seemed to like it. When our lunch was over we waved goodbye to our friends and continued on into the park to watch the rest of the festivities. They weren’t kidding about the celebration of the salmon! They had several round tubs of water surrounded with children laughing and screaming as they reached into the water and tried to grab a two foot long salmon with their bare hands. 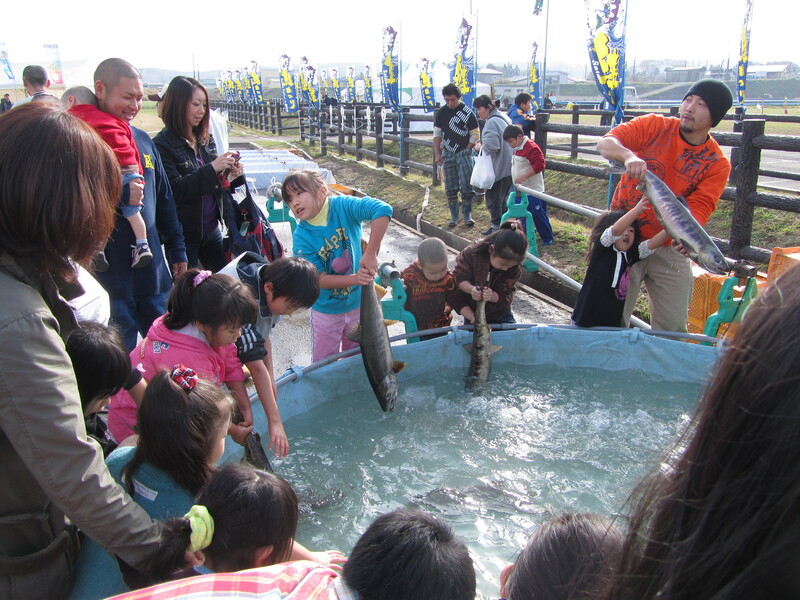 The fish would slip out of their grasp and splash the crowd much to the delight of the kids. 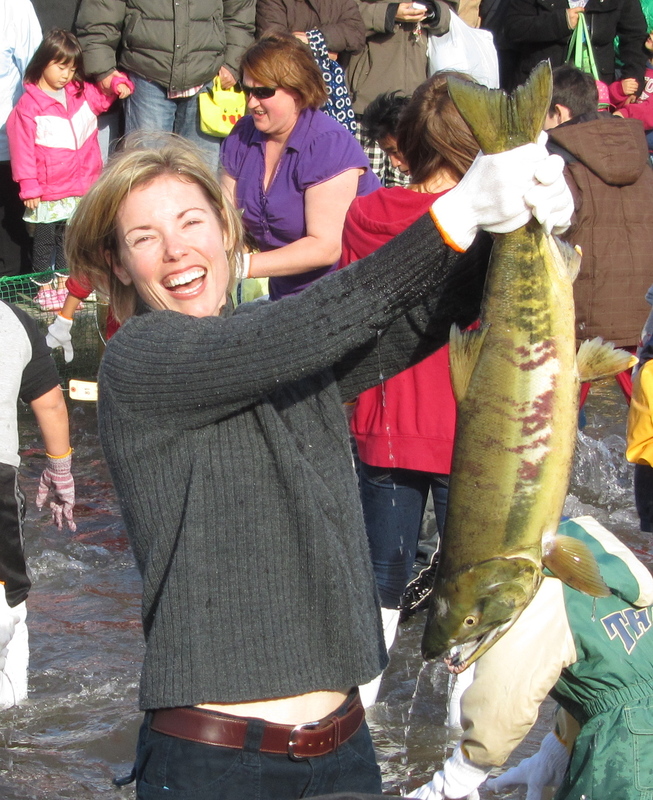 A nearby crowd was enjoying a salmon race. Five long water troughs were set about four feet apart. They were maybe twenty feet in length and twelve inches wide, filled with water. A large salmon was dropped into each lane when they blew a whistle. The racer was allowed to use a stick only to splash and scare the fish to swim the length of the lane the fastest. Some fish didn’t need any extra motivation to zoom off and others decided not to participate. It was quite entertaining to watch the enthusiasm and reactions of the crowd, not to mention the elation or frustration of the salmon racers. As I stood there watching, I remembered racing frogs when I was young. I recalled dealing with the same feelings depending on the cooperation of my particular frog. “I think you should be one of the fishermen!” He said with a beaming smile across his face, as he handed me a paper ticket, and grabbed my hand to lead me over to a small tent. “You’ve got to be kidding!” I said stopping dead in my tracks. “I forgot that I’ve heard about this part before. You get into the water and catch the salmon with your bare hands. I think you should hop in there and catch us some salmon for supper tonight!” He had the strangest look of smug satisfaction on his face. I stood there staring at him in disbelief. He tried to keep me walking forward. He just smiled confidently at me and fished around in his pocket for something as he continued to explain, “That’s why I also rented you some gloves and water boots. I think you should do this. I brought the camera.” He proudly freed the camera from his pocket and held it up for me to see. “You planned this, didn’t you? You knew this was going to happen.” I replied suspiciously. “I didn’t know all the details, but it’s working out nicely, don’t you think?” He said as I bit my bottom lip to contain my next thought. With the familiar, sneaky look on his face, I started to laugh. A nervous, high-pitched laugh, but I knew my immediate future was sealed. I reluctantly walked into the small tent. A man asked me what size my shoes were and gave me some tall, white, rubber boots to try on, and a pair of gloves. I sat down on a small bench, took off my shoes, and pulled the boots over my slacks. They would work just fine. I gave him my shoes to put on a shelf, and Dave and I walked down to the line forming around a 50 x 25 foot rectangular pool, filled with splashing, anxious salmon. My stomach was churning. Dave and Cameron stood in the spectator line while I hung out with the other people in rented, white boots. The announcers of the salmon catch walked out onto a platform next to the pond. 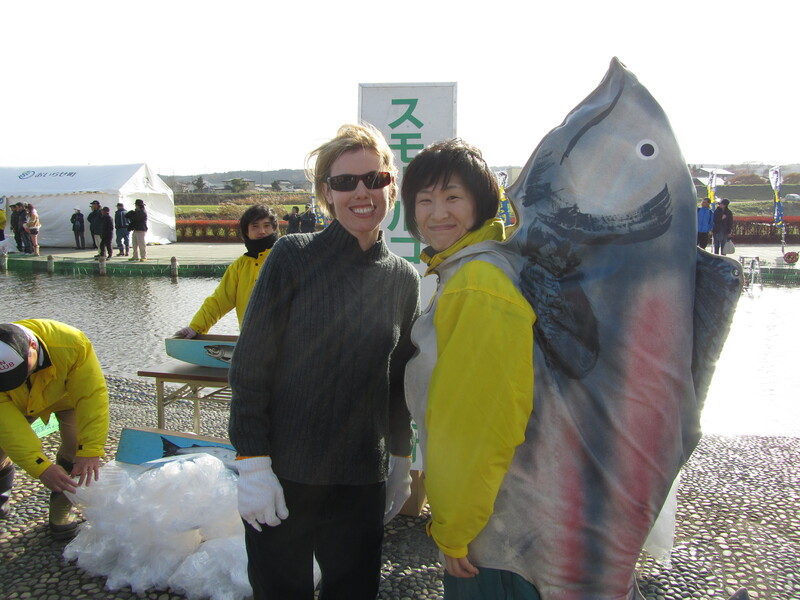 They both had on large, stuffed fish costumes over their water gear as they announced the start of the big event. The contestants were led through the gate and lined up alongside the rectangular pool. Dave and Cameron joined me shortly as we listened to the English translator explain what was about to happen. “Welcome Friends to the annual Salmon Festival of Oriase!” A crowd of spectators gathered around to cheer and yell. “The salmon have returned and YOU are going to catch them! When I blow the whistle, please carefully enter the pool and start to fish! Be careful, the fish are slippery and they will knock you down. We’ll be giving out prizes for the largest catch of the day, the smallest catch of the day, and the fisherman with the most style for catching their fish. I would advise you to go for the tail and hold on tight ladies and gentlemen, they are tough little creatures! You will have four minutes to catch your fish. The officials will be walking around handing out plastic bags for you to take your fish home and enjoy! We will be starting in one minute. Good luck! I glanced back at Dave, pleading with my eyes to get me out of there, but he only gave me a thumbs up with the camera out and ready to go. “Catch us a big one, honey!” was all I heard before the whistle blew. I steadied my stance again as the fish were getting more and more disturbed, anxious, and carelessly swimming straight into my legs. People were grabbing at fish and losing the battles all around me. Some were successful and walking away with giant salmon. The announcer was warning us about the time, but I tuned him out and got serious. It was time to catch my fish. I gave myself some space and I waited for an opportune moment. A fish took a turn between my legs and I pounced. I felt the side fins go between my fingers in a flash, and I clamped down just in time before the tail whipped through my grasp. I yanked that fish right out of the water by its tail. This one was not getting away. I beamed with pride towards Dave, as the camera snapped, and the fish jerked and thrashed around in my hands. There was no way I was letting it go. An official in a yellow jacket rushed up to me with a plastic bag as I suddenly realized I was holding a three foot long live, slimy, nasty, dirty, old fish in my hands. I gratefully placed it in the bag and let Dave help me out of the pool. “I knew you could do it! You caught us a nice one! Way to go! Cameron, say ‘way to go, mommy!” He raised up her little arms in a victory pose. “Thank you honey.” I gave Cameron a kiss on the head and Dave a light kiss on the cheek. “Are you really proud of me?” I asked still smiling. “Good thing, because I don’t wanna to do it.” I replied as I handed over my bagged fish and a 500 Yen coin at the tent entrance. We turned our heads to look away from the assembly line of workers efficiently killing, cleaning, and filleting each fish. At the far side of the tent, we were presented with several massive, bloody salmon fillets to stash in our freezer for months. 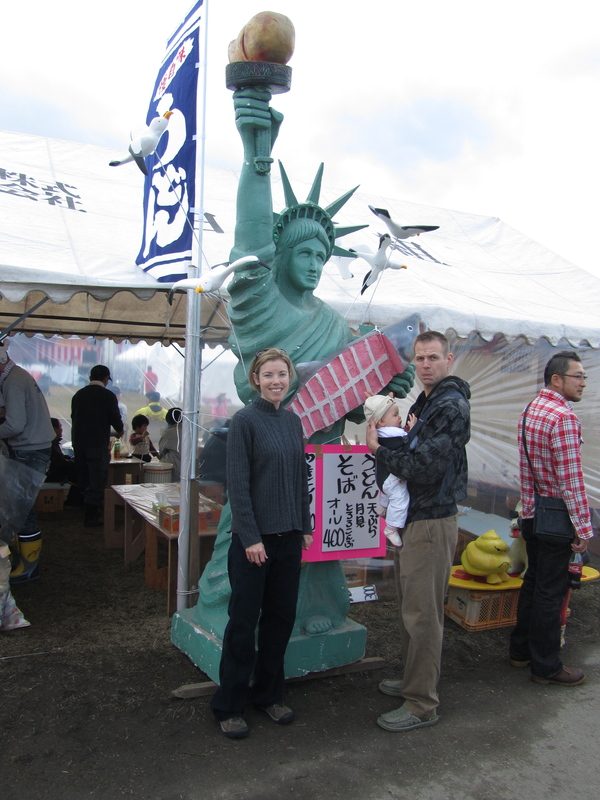 We agreed it wasn’t a bad prize to walk away with from our first Japanese salmon festival.